< Back to Why use Aquron 300? Why Readymix Companies USE Aquron 300 concrete waterproofing addtive? AQURON 300 has no VOC or hazardous ingredients such as cacogenics like each other waterproofing products. 3 Benefits in 1 Additive - AQURON 300 Concrete Waterproofing additive provides three benefits in one solution, Waterproofing, Strengthening and Shrinkage Reduction. AQURON 300 significantly reduces costs eliminating the need for multiple products in to the concrete mix to achieve Waterproofing, Strengthening and Shrinkage Reduction. This reduces the number of suppliers, products and costs making a much smoother process. The other advantage of having a 3n1 concrete waterproofing additive eliminating compatibility issues, and the chemical reactions that can occur between different products. Guaranteed Performance - The AQURON 300 concrete waterproofing additive comes with a 15 year project specific guarantee, so you can trust that this product will last. Less Shrinkage and Cracking Risks - Hydration is the key to reducing shrinkage and slab curl in concrete structures, and with less shrinkage there is less risk of cracking. AQURON 300 improves the hydration process with the concrete during the curing period and therefore reduces shrinkage and the cracking risks. Self-healing - If non-moving concrete cracks occur in concrete which has been treated with AQURON 300 waterproofing additive, the concrete will provide a self healing effect whereby it forms a CSH Hydrogel (Calcium Silicates Hydrates) to fill any voids or crack. 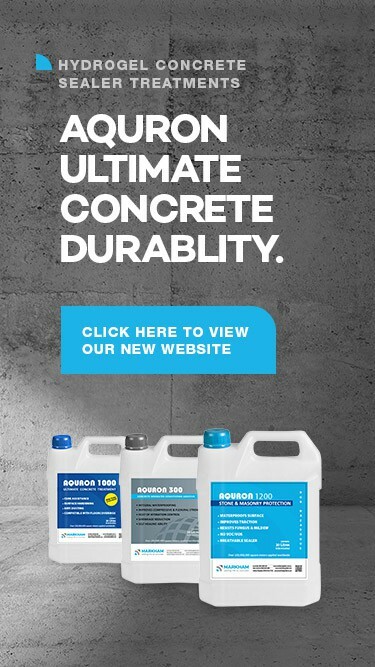 Improves Concrete Strength - The unique hydrogel that is produced using AQURON 300 Concrete Waterproofing Additive provides improved concrete hydration making concrete stronger than untreated concrete. Both the flexural and tensile strengths are improved. There is no other product on the market which provides both waterproofing and strengthening all in one. Permanent Waterproofing - As AQURON 300 Concrete Waterproofing Additive is inside the concrete mix, rather than a treatment that is applied to the concrete, and forms a hydrogel throughout porosity, the waterproofing is as long lasting as the concrete itself. It cannot wear off over time as it is permanently inside the matrix of the concrete. Internal Corrosion Protection - As AQURON 300 is an additive to the concrete rather than a treatment, it starts working from day one and is long lasting. Unlike a treatment that is applied to the concrete, there is no waiting time between pouring the concrete and applying a treatment, and it cannot wear off over time as it is not a layer on top of the concrete, it is part of the concrete itself. Why Aquron 300 is easier for READY MIX Operaters? Why CONCRETE LAYERS use Aquron 300 Waterproofing Additive?